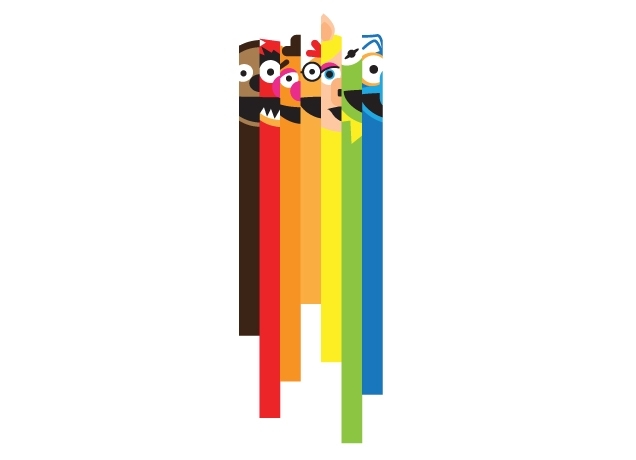 Threadless.com recently debuted this new shirt with the Muppet characters that I am totally in love with. Being a child of the Muppet/Sesame Street generation, this shirt stirs all sorts of wonderful memories in my mind. I can picture myself in my bedroom with the bright yellow window trim and the old, boxy tv watching Ralph play the piano, Miss Piggy swoon over Kermy and Animal rock out on the drums. My favorite memory of the Muppets? A Muppet Family Christmas. Easily one of my top 5 Christmas movies of all time, and if you know how much I love Christmas movies, you know that's a big deal. The basic premise of the movie is Fozzy Bear takes everyone up to surprise his mom for Christmas... all the Muppet Characters and Sesame Street characters are there, and Animal has to sleep on a hanger on the wall, haha.The Christmas turkey flirts with Gonzo's chicken girlfriend while running from the Swedish Chef who loses interest in cooking him when he spots Big Bird. Take my advice... buy it now so you are ready when Christmas rolls around... or turn down your AC, bundle up and have Christmas in July. And go ahead and buy the shirt for an early gift to yourself.